Recently several states in the US enacted their own distracted driver laws. Talking on the cellphone while driving definitely qualifies as a distraction. NoiseHush has attempted to address this issue by a solar-powered hands-free Bluetooth carkit. 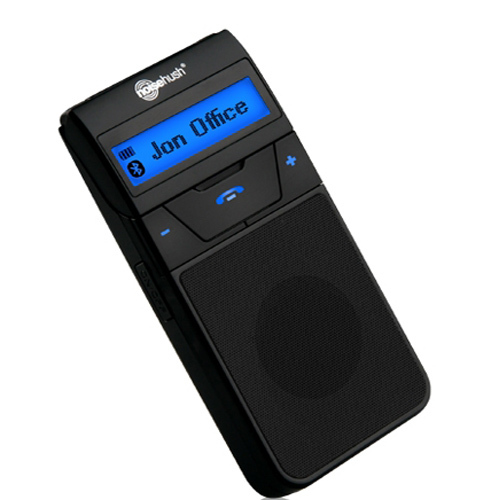 The accompanying literature states the device provides unlimited talk time while charging its battery, is Bluetooth version 2.1 compatible, has an adjustable LCD screen, and is easily installed in any car. 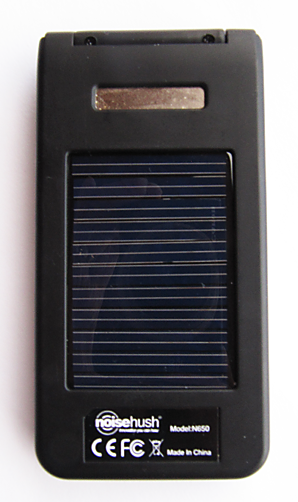 The NoiseHush SolarVisor N650 is a fairly lightweight, 4.5 x 2 inch black plastic device. A small magnet and solar cell is located on the rear of the unit. A clear plastic windshield mount, USB car charger, and instruction manual are included with the kit. The NoiseHush SolarVisor N650 needs to be fully charged before using. It takes two hours with the USB car charger or approximately twenty-eight hours if using sunlight. The three buttons on the front of the N650 are straightforward. The center button has a phone icon to answer or or end a call. The negative and positive sign icons on each side of the center button are to lower or increase the volume. Prior to using the device for the first time, it needs to be paired with a Bluetooth-enabled mobile phone. The N650 can remember up to eight paired phones. 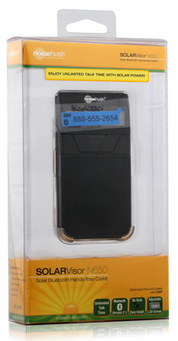 The NoiseHush SolarVisor N650 also allows a paired user to transfer their phone numbers from their phone to the device’s phone book using OPP (Object Push Profile). The instruction manual states it can store up to 400 phone numbers. After charging the device’s battery by the USB charger, which did take the recommended two hours, I was ready to install it in my car. 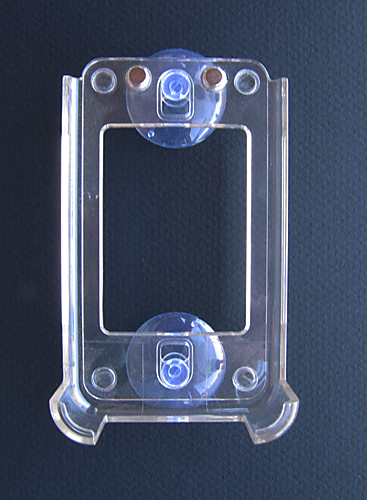 The windshield mount has two small suction cups to attach it to the car windshield. This was a problem in a Nissan Murano as the windshield is curved. I tried in two other vehicles that did not have the windshield curvature and was successful attaching the mount in only one of the cars after many attempts. The suction cups simply do not stick. Two small magnets on the windshield mount connect to a magnet on the back of the NoiseHush SolarVisor N650 to secure it for driving. I would advise caution when using the NoiseHush SolarVisor N650 in the windshield mount. When I stopped at a red light – I did not brake very hard – the NoiseHush SolarVisor N650 became a projectile. As the magnets are not very strong, the device came out of the mount and flew at my head. This is very dangerous and the developer needs to address this issue of the magnet contact as well as the suction cups not adhering. After that incident, I was reluctant to use the windshield mount and instead placed the device on the car console. The LCD screen lifts up so the device can be charged on the dashboard but does not allow access to the phone or volume control buttons from that angle. The NoiseHush SolarVisor N650 did hold a charge for a long time and charging it from the dashboard with the abundant Arizona sunshine was quite swift. The NoiseHush SolarVisor N650 is not completely voice activated and that means you still need to press the phone icon to answer, reject, or end a call. This can present a problem when a call comes in and you have to take your eyes off the road to answer or end a call. If the device is mounted on the windshield this means taking your hand off the wheel and fumbling to answer the call or knocking the unit out of the flimsy windshield mount. Using the NoiseHush N650 in this manner will potentially be dangerous or distracting while driving. It does allow for voice dialing but the phone icon still needs to be pushed in order to activate that function . The sound quality of the NoiseHush N650 is crisp, clean, and without static. The volume out of the box is quite loud and I found I had to lower it to an acceptable decibel level. It does not pick up a lot of extraneous road or interior car noise. I asked the callers how the sound and voice was on their end and all agreed it was audibly clear without any distortion. To turn the device on or off there is a button on the left side of the NoiseHush N650. That mechanism would seem fairly obvious but I found the device randomly switching back on after I repeatedly turned it off. The instruction manual addresses this issue in the troubleshooting guide by “press on/off button and volume + button simultaneously to turn off the N650.” I did this numerous times without success. I emailed WirelessGround.Com and the NoiseHush representative replied that he had asked NoiseHush reviewers as well as the manufacturer about the problem. He stated that the device I attempted to pair it to (my iPhone 3GS) could be in “discoverable” mode and the NoiseHush N650 may have a “bug” that was telling it to turn off and on. I removed all phones from the car and sat in my car and the NoiseHush N650 still continued to randomly turn on even after I shut it off. Curious to why the device would not shut off completely and was producing an irritating, loud beeping sound, I charged the solar battery fully. I placed the NoiseHush N650 in my car that is stored in the garage. I shut the device off per the troubleshooting manual and no phones were within 30 feet of the device. After an hour the shrill up/down beeping sequence began, although the unit was turned off. It continued to produce these annoying tones until the battery completely discharged. The NoiseHush SolarVisor N650 needs improvement to compete with the ubiquitous Bluetooth earbud devices. Though the calls are distinct and distortion-free, the poor mechanical design, lack of a working on/off switch, and absence of voice activation are flaws in an otherwise innovative product. The price of the NoiseHush SolarVisor N650 should warrant a better quality hands-free product. NoiseHush sell their products on their website and through online retailers and this product is available at WirelessGround.Com. 60 Billion worth of Truffles!